Look: Bright and clear ruby-red color of medium intensity with purple/pink shade on the rim. No sediments nor mineral deposits. Some tears on the glass wall, developing after a couple of minutes. Nose: Clean without any off odor. Medium to pronounced aroma of red berries, cherry and currant. Rich bouquet developing with upfront of plum/prune, almond and hints of milk chocolate. Taste: Dry with pleasantly refreshing acidity. Very smooth texture with medium body and very soft tannins. Moderate to full flavor intensity with cherry and red berry upfront developing to plum and prune and very light clove hints on the outer layers. Clean and balanced lingering finish. What a great wine! 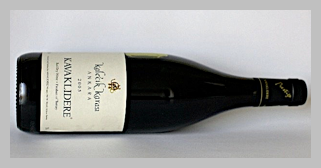 I am personally a Pinot-Noir lover and this Kalecik Karasi offers similar soft tannins and red berry flavors, but with a very smooth, luscious and luxurious feeling on the tongue without being overly complicated. I absolutely love the plumy/prune notes of this wine which gives it character. Although this wine is labeled at 14% alcohol, it does not taste vinous at all and is very easy to drink, so make sure to pace yourself if you will have several glasses. I have had a 2007 Kalecik Karasi before but was not really impressed by it. This 2005 Prestige totally makes up for the younger, rougher vintage and I would definitely recommend it with aromatic appetizers such as marinated roasted/grilled vegetables (Tomatoes, red peppers, eggplants, zucchini, yellow squashes…), marinated mozzarella or tangy herbed goat cheese or feta, savory salads that would include dried fruits and/or toasted nuts as well as for delicate red meat preparations and I would even try it with certain full-flavor fish such as grilled salmon, tuna or swordfish.